So on the appointed time of Monday, September 14, 1964, the Mainichi Daily News reported that “hordes of onlookers, young and old, flocked to the place of challenge in front of the fountain in Hibiya Park.” Members of the Miyuki-zoku came out to meet the challenge of the 56-year old, but as it turned out, not only did the elderly challenger not appear, the police had already rushed to the scene to ensure an unauthorized marathon did not take place. It was only a few months earlier when Heibon Punch, a new magazine focusing on fashion, started a revolution by launching the so-called “Ivy Look”. Other magazines like “Men’s Club” followed quickly, going into detail on cool Ivy. (See my previous post on this here.) 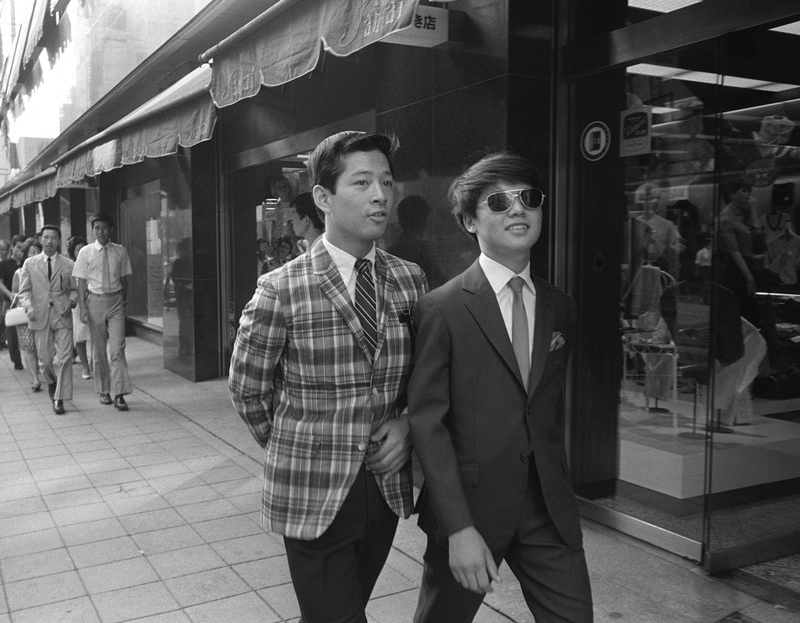 When teenagers in Japan saw how young men were dressing in the United States, particularly at the Ivy League universities, with their perceived associations of class and style, they found an exciting replacement for their drab, black school uniforms, and a way to rebel. Yes, it took the preppie look for kids in Tokyo to flip parents and authorities the bird – which is astonishing, if you look at the pictures today. But this is Japan. And the Japanese proverb most quoted to explain social behavior here is “the nail that sticks out gets hammered down.” In other words, it’s important to conform. Those who don’t, are informed in no uncertain terms that they need to do so. And so in the 1960s, in a time of burgeoning prosperity, with a generation that grew up with faint memories of post-war rubble and hunger, there grew a hunger to express one’s individuality, and dare to be that nail that sticks out, even if just a tad. But the authorities were concerned about even this whiff of rebellion. After all, the Olympics were coming to town and Tokyo had to be clean, friendly and most of all orderly. These “hordes” were unsightly, the boys in their (gulp) tight, high-cut slacks with oxford-cloth or madras plaid shirts, and the girls in tight long skirts with the hemline (gasp) several inches below the knee. According to this post in the blog “Ivy Style”, the older generation co-opted a leader of the Ivy fashion movement, Kensuke Ishizu. Ishizu “discovered” this look when he visited college campuses in the United States in the 1950s, and when he returned to Japan, he created a fashion brand called “VAN”, and published Japan’s first men’s fashion magazine, “Otoko no Fukushoku”. Neighborhood leaders desperately wanted to eradicate the Miyuki-zoku before October, so they went to Ishizu of VAN and asked him to intervene. VAN organized a “Big Ivy Style Meet-up” at Yamaha Hall, and cops helped put 200 posters across Ginza to make sure the Miyuki-zoku showed up. Anyone who came to the event got a free VAN bag — which was the bag for storing your normal clothing during loitering hours. They expected 300 kids, but 2,000 showed up. Ishizu gave the keynote address, where he told everyone to knock it off with the lounging in Ginza. Most acquiesced, but not all. So on September 19, 1964, a huge police force stormed Ginza and hauled off 200 kids in madras plaid and penny loafers. Eighty-five were processed at nearby Tsukiji jail. The kids got the message and never came back, and that was the end of the Miyuki-zoku. Posted in Japan, Others, Pop Culture, Tokyo 1964, Tourism and tagged Ginza, Ivy Stle, Kensuke Ishizu, marathon, Miyuki-zoku, VAN. Bookmark the permalink. love this article and the photos. Thanks so much. Tight pants and the right attitudes…go Japan!! !